A joint-stock company is a business entity in which shares of the company's stock can be bought and sold by shareholders. Each shareholder owns company stock in proportion, evidenced by their shares (certificates of ownership). Shareholders are able to transfer their shares to others without any effects to the continued existence of the company. In modern-day corporate law, the existence of a joint-stock company is often synonymous with incorporation (possession of legal personality separate from shareholders) and limited liability (shareholders are liable for the company's debts only to the value of the money they have invested in the company). Therefore, joint-stock companies are commonly known as corporations or limited companies. Ownership refers to a large number of privileges. The company is managed on behalf of the shareholders by a board of directors, elected at an annual general meeting. The shareholders also vote to accept or reject an annual report and audited set of accounts. Individual shareholders can sometimes stand for directorships within the company if a vacancy occurs, but that is uncommon. The shareholders are usually liable for any of the company debts that extend beyond the company's ability to pay up to the amount of them. 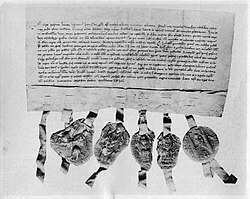 The transfer letter from 1288 through which Bishop Peter of Västerås reacquires an eighth of Tiskasjöberg, Kopparberget. The original can be found at Riksarkivet (National Archive) in Stockholm. Replica of an East Indiaman of the Dutch East India Company/United East India Company (VOC). 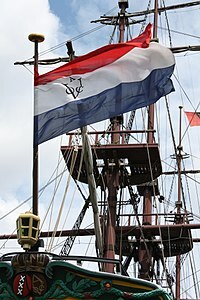 Founded in 1602, the VOC was a pioneering early model of joint-stock companies at the dawn of modern capitalism. The VOC is often considered by many to be the world's first permanently organized limited-liability joint-stock company, with a permanent capital base. In other words, the VOC was the first recorded joint-stock company to get a fixed capital stock. One of the oldest known stock certificates, issued by the VOC chamber of Enkhuizen, dated 9 Sep 1606. Courtyard of the Amsterdam Stock Exchange (or Beurs van Hendrick de Keyser in Dutch), the world's first formal stock exchange. The VOC's 17th-century business model played a crucial role in the evolution of modern-day joint-stock corporations, especially publicly traded companies. Finding the earliest joint-stock company is a matter of definition. The earliest records of joint stock company can be found in China during the Song Dynasty (960–1279). Around 1250 in France at Toulouse, 96 shares of the Société des Moulins du Bazacle, or Bazacle Milling Company were traded at a value that depended on the profitability of the mills the society owned, making it probably the first company of its kind in history. The Swedish company Stora has documented a stock transfer for an eighth of the company (or more specifically, the mountain in which the copper resource was available) as early as 1288. In more recent history, the earliest joint-stock company recognized in England was the Company of Merchant Adventurers to New Lands, chartered in 1553 with 250 shareholders. Muscovy Company, which had a monopoly on trade between Moscow and London, was chartered soon after in 1555. The much more famous, wealthy and powerful English (later British) East India Company was granted an English Royal Charter by Elizabeth I on December 31, 1600, with the intention of favouring trade privileges in India. The Royal Charter effectively gave the newly created Honourable East India Company a 15-year monopoly on all trade in the East Indies. The Company transformed from a commercial trading venture to one that ruled India and exploited its resources, as it acquired auxiliary governmental and military functions, until its dissolution. Soon afterwards, in 1602, the Dutch East India Company issued shares that were made tradable on the Amsterdam Stock Exchange. That invention enhanced the ability of joint-stock companies to attract capital from investors, as they could now easily dispose their shares. In 1612, it became the first 'corporation' in intercontinental trade with 'locked in' capital and limited liability. During the period of colonialism, Europeans, initially the British, trading with the Near East for goods, pepper and calico for example, enjoyed spreading the risk of trade over multiple sea voyages. The joint-stock company became a more viable financial structure than previous guilds or state-regulated companies. The first joint-stock companies to be implemented in the Americas were The London Company and The Plymouth Company. Transferable shares often earned positive returns on equity, which is evidenced by investment in companies like the British East India Company, which used the financing model to manage trade in India. Joint-stock companies paid out divisions (dividends) to their shareholders by dividing up the profits of the voyage in the proportion of shares held. Divisions were usually cash, but when working capital was low and detrimental to the survival of the company, divisions were either postponed or paid out in remaining cargo, which could be sold by shareholders for profit. The East India Company's flag initially had the flag of England, St George's Cross, in the corner. However, in general, incorporation was possible by royal charter or private act, and it was limited because of the government's jealous protection of the privileges and advantages thereby granted. As a result of the rapid expansion of capital-intensive enterprises in the course of the Industrial Revolution in Britain, many businesses came to be operated as unincorporated associations or extended partnerships, with large numbers of members. Nevertheless, membership of such associations was usually for a short term so their nature was constantly changing. Consequently, registration and incorporation of companies, without specific legislation, was introduced by the Joint Stock Companies Act 1844. Initially, companies incorporated under this Act did not have limited liability, but it became common for companies to include a limited liability clause in their internal rules. In the case of Hallett v Dowdall, the English Court of the Exchequer held that such clauses bound people who have notice of them. Four years later, the Joint Stock Companies Act 1856 provided for limited liability for all joint-stock companies provided, among other things, that they included the word "limited" in their company name. The landmark case of Salomon v A Salomon & Co Ltd established that a company with legal liability, not being a partnership, had a distinct legal personality that was separate from that of its individual shareholders. ...a corporation is an abstraction. It has no mind of its own any more than it has a body of its own; its active and directing will must consequently be sought in the person of somebody who is really the directing mind and will of the corporation, the very ego and centre of the personality of the corporation. This 'directing will' is embodied in a corporate Board of Directors. The legal personality has two economic implications. It grants creditors (as opposed to shareholders or employees) priority over the corporate assets upon liquidation. Second, corporate assets cannot be withdrawn by its shareholders, and assets of the firm cannot be taken by personal creditors of its shareholders. The second feature requires special legislation and a special legal framework, as it cannot be reproduced via standard contract law. Limited liability Unlike a partnership or sole proprietorship, shareholders of a modern business corporation have "limited" liability for the corporation's debts and obligations. As a result, their losses cannot exceed the amount that they contributed to the corporation as dues or payment for shares. That enables corporations to "socialize their costs" for the primary benefit of shareholders; to socialize a cost is to spread it to society in general. The economic rationale is that it allows anonymous trading in the shares of the corporation by eliminating the corporation's creditors as a stakeholder in such a transaction. Without limited liability, a creditor would probably not allow any share to be sold to a buyer at least as creditworthy as the seller. Limited liability further allows corporations to raise large amounts of finance for their enterprises by combining funds from many owners of stock. Limited liability reduces the amount that a shareholder can lose in a company. That increases the attraction to potential shareholders and so increases both the number of willing shareholders and the amount they are likely to invest. However, some jurisdictions also permit another type of corporation in which shareholders' liability is unlimited, for example the unlimited liability corporation in two provinces of Canada, and the unlimited company in the United Kingdom. In many jurisdictions, corporations whose shareholders benefit from limited liability are required to publish annual financial statements and other data so that creditors who do business with the corporation are able to assess the credit-worthiness of the corporation and cannot enforce claims against shareholders. Shareholders, therefore, experience some loss of privacy in return for limited liability. That requirement generally applies in Europe, but not in common law jurisdictions, except for publicly traded corporations (for which financial disclosure is required for investor protection). In many countries, corporate profits are taxed at a corporate tax rate, and dividends paid to shareholders are taxed at a separate rate. Such a system is sometimes referred to as "double taxation" because any profits distributed to shareholders will eventually be taxed twice. One solution, followed by as in the case of the Australian and UK tax systems, is for the recipient of the dividend to be entitled to a tax credit to address the fact that the profits represented by the dividend have already been taxed. The company profit being passed on is thus effectively taxed only at the rate of tax paid by the eventual recipient of the dividend. In other systems, dividends are taxed at a lower rate than other income (for example, in the US), or shareholders are taxed directly on the corporation's profits, while dividends are not taxed (for example, S corporations in the US). The institution most often referenced by the word "corporation" is publicly traded, which means that the company's shares are traded on a public stock exchange (for example, the New York Stock Exchange or Nasdaq in the United States) whose shares of stock of corporations are bought and sold by and to the general public. Most of the largest businesses in the world are publicly traded corporations. However, the majority of corporations are privately held, or closely held, so there is no ready market for the trading of shares. Many such corporations are owned and managed by a small group of businesspeople or companies, but the size of such a corporation can be as vast as the largest public corporations. Closely held corporations have some advantages over publicly traded corporations. A small, closely held company can often make company-changing decisions much more rapidly than a publicly traded company, as there will generally be fewer voting shareholders, and the shareholders would have common interests. A publicly traded company is also at the mercy of the market, with capital flow in and out based not only on what the company is doing but also on what the market and even what the competitors, major and minor, are doing. However, publicly traded companies also have advantages over their closely held counterparts. Publicly traded companies often have more working capital and can delegate debt throughout all shareholders. Therefore, shareholders of publicly traded company will each take a much smaller hit to their returns as opposed to those involved with a closely held corporation. Publicly traded companies, however, can suffer from that advantage. A closely held corporation can often voluntarily take a hit to profit with little to no repercussions if it is not a sustained loss. A publicly traded company often comes under extreme scrutiny if profit and growth are not evident to stock holders, thus stock holders may sell, further damaging the company. Often, that blow is enough to make a small public company fail. Often, communities benefit from a closely held company more so than from a public company. A closely held company is far more likely to stay in a single place that has treated it well even if that means going through hard times. Shareholders can incur some of the damage the company may receive from a bad year or slow period in the company profits. Closely held companies often have a better relationship with workers. In larger, publicly traded companies, often after only one bad year, the first area to feel the effects is the workforce with layoffs or worker hours, wages or benefits being cut. Again, in a closely held business the shareholders can incur the profit damage rather than passing it to the workers. The affairs of publicly traded and closely held corporations are similar in many respects. The main difference in most countries is that publicly traded corporations have the burden of complying with additional securities laws, which (especially in the US) may require additional periodic disclosure (with more stringent requirements), stricter corporate governance standards as well as additional procedural obligations in connection with major corporate transactions (for example, mergers) or events (for example, elections of directors). A closely held corporation may be a subsidiary of another corporation (its parent company), which may itself be either a closely held or a public corporation. In some jurisdictions, the subsidiary of a listed public corporation is also defined as a public corporation (for example, in Australia). In Australia corporations are registered and regulated by the Commonwealth Government through the Australian Securities and Investments Commission. Corporations law has been largely codified in the Corporations Act 2001. In Brazil there are many different types of legal entities (sociedades), but the two most common ones commercially speaking are (i) sociedade limitada, identified by "Ltda." or "Limitada" after the company's name, equivalent to the British limited liability company, and (ii) sociedade anônima or companhia, identified by "SA" or "Companhia" in the company's name, equivalent to the British public limited company. The "Ltda." is mainly governed by the new Civil Code, enacted in 2002, and the "SA", by Law 6.404, dated December 15, 1976, as amended. In Canada both the federal government and the provinces have corporate statutes, and thus a corporation may be incorporated either provincially or federally. Many older corporations in Canada stem from Acts of Parliament passed before the introduction of general corporation law. The oldest corporation in Canada is the Hudson's Bay Company; though its business has always been based in Canada, its Royal Charter was issued in England by King Charles II in 1670, and became a Canadian charter by amendment in 1970 when it moved its corporate headquarters from London to Canada. Federally recognized corporations are regulated by the Canada Business Corporations Act. The Chilean form of joint-stock company is called sociedad por acciones (often abbreviated "SpA"). They were created in 2007 by Law N° 20.190, and they are the most recent variety of societary types, as they represent a simplified form of corporation – originally conceived for venture capital companies. The Czech form of the public limited company is called akciová společnost (a.s.) and its private counterpart is called společnost s ručením omezeným (s.r.o.). Their Slovak equivalents are called akciová spoločnosť (a.s.) and spoločnosť s ručením obmedzeným (s.r.o.). Italy recognizes three types of company limited by shares: the public limited company (società per azioni, or S.p.A.), the private limited company (società a responsabilità limitata, or S.r.l. ), and the publicly traded partnership (società in accomandita per azioni, or S.a.p.a.). The latter is a hybrid of the limited partnership and public limited company, having two categories of shareholders, some with and some without limited liability, and is rarely used in practice. In Japan, both the state and local public entities under the Local Autonomy Act (now 47 prefectures, made in the 19th century and municipalities) are considered to be corporations (法人, hōjin). Non-profit corporations may be established under the Civil Code. The term "company" (会社, kaisha) or (企業 kigyō) is used to refer to business corporations. The predominant form is the Kabushiki gaisha (株式会社), used by public corporations as well as smaller enterprises. Mochibun kaisha (持分会社), a form for smaller enterprises, are becoming increasingly common. Between 2002 and 2008, the intermediary corporation (中間法人, chūkan hōjin) existed to bridge the gap between for-profit companies and non-governmental and non-profit organizations. In Norway a joint-stock company is called an aksjeselskap, abbreviated AS. A special and by far less common form of joint-stock companies, intended for companies with a large number of shareholders, is the publicly traded joint-stock companies, called allmennaksjeselskap and abbreviated ASA. A joint-stock company must be incorporated, has an independent legal personality and limited liability, and is required to have a certain capital upon incorporation. Ordinary joint-stock companies must have a minimum capital of NOK 30,000 upon incorporation, which was reduced from 100,000 in 2012. Publicly traded joint-stock companies must have a minimum capital of NOK 1 million. In Romania, a joint-stock company is called "societate pe acțiuni". According to Law 31/1991 there are two types of joint-stock companies: "societatea pe acțiuni" and "societate în comandită pe acţiuni". See: Open joint-stock company (OJSC). In Spain there are two types of companies with limited liability: (i) "S.L. ", or Sociedad Limitada (a private limited company), and (ii) "S.A.", or Sociedad Anónima (similar to a public limited company). There exist several types of joint stock companies (Ukrainian: Акціонерне Товариство, Aktsionerne Tovarystvo) in Ukraine. Due to specifics of the Soviet economy, all enterprises in the Soviet republic as the rest of the Soviet Union were state owned and private entrepreneurship was strictly prohibited and criminally prosecuted. Following the Gorbachev initiated broad spectrum reforms (perestroika), there was introduced a term of khozraschet and permission for organization of public economic entities called cooperatives. Following dissolution of the Soviet Union, Ukraine's economy along with the rest former Soviet republics was further reformed to more liberal. Along with private entrepreneurship, many state owned companies were privatized, primarily by the former party's apparatchiks which gave a rise of another term "Red directors". Many companies started to be sold at open market and commercialized. Those companies were transformed in joint-stock companies by selling their shares for mutual cooperation and investment. In 2009 further reforms were introduced and open joint-stock companies were forced to be restructured as public joint-stock company (Ukrainian: Публічне Акціонерне Товариство, Publichne Aktsionerne Tovarystvo) or private joint-stock company (Ukrainian: Приватне Акціонерне Товариство, Pryvatne Aktsionerne Tovarystvo). Minimum amount of share capital is 1250 minimum wages (as of 1 January 2017 4,000,000 UAH or 148,000 USD). Ukraine National Securities and Stock Market Commission is the main stock market state authority. Most companies are regulated by the Companies Act 2006 (or the Northern Ireland equivalent). The most common type of company is the private limited company ("Limited" or "Ltd"). Private limited companies can either be limited by shares or by guarantee. Other corporate forms include the public limited company ("plc") and the private unlimited company. Some corporations, both public and private sector, are formed by Royal Charter or Act of Parliament. A special type of corporation is a corporation sole, which is an office held by an individual natural person (the incumbent), but which has a continuing legal entity separate from that person. Several types of conventional corporations exist in the United States. Generically, any business entity that is recognized as distinct from the people who own it (i.e., is not a sole proprietorship or a partnership) is a corporation. This generic label includes entities that are known by such legal labels as ‘association’, ‘organization’ and ‘limited liability company’, as well as corporations proper. Only a company that has been formally incorporated according to the laws of a particular state is called ‘corporation’. A corporation was defined in the Dartmouth College case of 1819, in which Chief Justice Marshall of the United States Supreme Court stated that " A corporation is an artificial being, invisible, intangible, and existing only in contemplation of the law". A corporation is a legal entity, distinct and separate from the individuals who create and operate it. As a legal entity the corporation can acquire, own, and dispose of property in its own name like buildings, land and equipment. It can also incur liabilities and enter into contracts like franchising and leasing. American corporations can be either profit-making companies or non-profit entities. Tax-exempt non-profit corporations are often called “501(c)3 corporation”, after the section of the Internal Revenue Code that addresses the tax exemption for many of them. The federal government can only create corporate entities pursuant to relevant powers in the U.S. Constitution. Thus, virtually all corporations in the U.S. are incorporated under the laws of a particular state. A major exception to the federal nonparticipation in the incorporation of private businesses is in banking; under the National Bank Act, banks may receive charters from the federal government as "national banks," subjecting them to the regulation of the federal Office of the Comptroller of the Currency rather than state banking regulators. All states have some kind of "general corporation law" (California, Delaware, Kansas, Nevada and Ohio actually use that exact name) which authorizes the formation of private corporations without having to obtain a charter for each one from the state legislature (as was formerly the case in the 19th century). Many states have separate, self-contained laws authorizing the formation and operation of certain specific types of corporations that are wholly independent of the state general corporation law. For example, in California, nonprofit corporations are incorporated under the Nonprofit Corporation Law, and in Illinois, insurers are incorporated under the Illinois Insurance Code. Corporations are created by filing the requisite documents with a particular state government. The process is called “incorporation,” referring to the abstract concept of clothing the entity with a "veil" of artificial personhood (embodying, or “corporating” it, ‘corpus’ being the Latin word for ‘body’). Only certain corporations, including banks, are chartered. Others simply file their articles of incorporation with the state government as part of a registration process. Once incorporated, a corporation has artificial personhood everywhere it may operate, until such time as the corporation may be dissolved. A corporation that operates in one state while being incorporated in another is a “foreign corporation.” This label also applies to corporations incorporated outside of the United States. Foreign corporations must usually register with the secretary of state’s office in each state to lawfully conduct business in that state. A corporation is legally a citizen of the state (or other jurisdiction) in which it is incorporated (except when circumstances direct the corporation be classified as a citizen of the state in which it has its head office, or the state in which it does the majority of its business). Corporate business law differs dramatically from state to state. Many prospective corporations choose to incorporate in a state whose laws are most favorable to its business interests. Many large corporations are incorporated in Delaware, for example, without being physically located there because that state has very favorable corporate tax and disclosure laws. Companies set up for privacy or asset protection often incorporate in Nevada, which does not require disclosure of share ownership. Many states, particularly smaller ones, have modeled their corporate statutes after the Model Business Corporation Act, one of many model sets of law prepared and published by the American Bar Association. As juristic persons, corporations have certain rights that attach to natural persons. The vast majority of them attach to corporations under state law, especially the law of the state in which the company is incorporated – since the corporations very existence is predicated on the laws of that state. A few rights also attach by federal constitutional and statutory law, but they are few and far between compared to the rights of natural persons. For example, a corporation has the personal right to bring a lawsuit (as well as the capacity to be sued) and, like a natural person, a corporation can be libeled. Harvard College, an undergraduate school of Harvard University, formally the President and Fellows of Harvard College (also known as the Harvard Corporation), is the oldest corporation in the western hemisphere. Founded in 1636, the second of Harvard’s two governing boards was incorporated by the Great and General Court of Massachusetts in 1650. Significantly, Massachusetts itself was a corporate colony at that time – owned and operated by the Massachusetts Bay Company (until it lost its charter in 1684) - so Harvard College is a corporation created by a corporation. Many nations have modeled their own corporate laws on American business law. Corporate law in Saudi Arabia, for example, follows the model of New York State corporate law. In addition to typical corporations in the United States, the federal government, in 1971 passed the Alaska Native Claims Settlement Act (ANCSA), which authorized the creation of 12 regional native corporations for Alaska Natives and over 200 village corporations that were entitled to a settlement of land and cash. In addition to the 12 regional corporations, the legislation permitted a 13th regional corporation without a land settlement for those Alaska Natives living out of the State of Alaska at the time of passage of ANCSA. ^ Courtney, Thomas B. The Law of Private Companies (2nd ed.). p. 26. ISBN 1-85475-265-0. ^ "Joint Stock Company". West's Encyclopedia of American Law. Retrieved 4 May 2012. ^ Ferguson, Niall (2002). Empire: The Rise and Demise of the British World Order and the Lessons for Global Power, p. 15. ^ Dunkley, Jamie (11 Sep 2010). "Dutch student finds world's oldest share certificate". Telegraph.co.uk. Retrieved 1 November 2017. ^ "History of Paris stock exchanges"
^ Irwin, Douglas A. (December 1991). "Mercantilism as Strategic Trade Policy: The Anglo-Dutch Rivalry for the East India Trade". The Journal of Political Economy. The University of Chicago Press. 99 (6): 1296–1314. doi:10.1086/261801. JSTOR 2937731. at 1299. ^ Hansmann et al., The Anatomy of Corporate Law, pg 7. ^ A leading case in common law is Salomon v. Salomon & Co.  AC 22. ^ Hock, Dee (2005). One from Many: VISA and the Rise of Chaordic Organization. Berrett-Koehler Publishers. p. 140. ISBN 1-57675-332-8. ... they have become a superb instrument for the capitalization of gain and the socialization of cost. ^ Thor, Anatoliy. "Company and business formation in Ukraine". ^ Brachfeld, Aaron, USDA (February 2012). "Judge Boyette rules on corporate rights to self-represent" Meadowlark Herald Volume 3 Issue 6. Retrieved February 19, 2012. Davis, J.S. (1917). Essays in the Earlier History of American Corporations (vols. 1–2 ed.). Cambridge, MA: Harvard University Press. Ekelund, R.B. ; Tollison, R.D. (1980). "Mercantilist origins of the corporation". Bell Journal of Economics. The RAND Corporation. 11 (2): 715–720. doi:10.2307/3003390. JSTOR 3003390. Fisher, F. J. (1933). "Some experiments in company organization in the early seventeenth century". Economic History Review. Blackwell Publishing. 4 (2): 177–194. doi:10.2307/2590601. JSTOR 2590601. Freedman, C.E. (1979). Joint-Stock Enterprise in France 1807–1867: From Privileged Company to Modern Corporation. Chapel Hill: University of North Carolina Press. Hunt, B.C. (1936). The Development of the Business Corporation in England, 1800–1867. Cambridge, MA: Harvard University Press. Lobban, M. (1996). "Corporate identity and limited liability in France and England 1825-67". Anglo-American Law Review. 25: 397. Mayson, S.W; et al. (2005). Mayson, French & Ryan on Company Law (22nd ed.). London: Oxford University Press. ISBN 0-19-928531-4. Wikimedia Commons has media related to Joint-stock companies.